The New England Patriots released linebacker Brandon Spikes on Monday as authorities investigated whether a Mercedes he owned was involved in an accident after the car was found abandoned in a highway median near where three people were hurt in a car that was rear-ended. While it's not clear who had been driving, the driver of Spikes' 2011 Mercedes Maybach reported hitting a deer about 3:30 a.m. through the car's on-board navigation system, Massachusetts State Police spokesman David Procopio said in a statement. 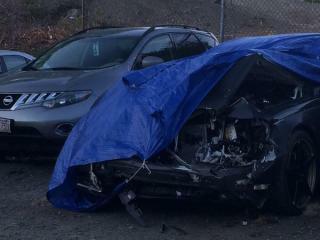 The car was found with front-end damage in the median near Interstate 495 in Foxborough, near Patriots team headquarters. "Whoever had been driving it was no longer at the scene," Procopio said. 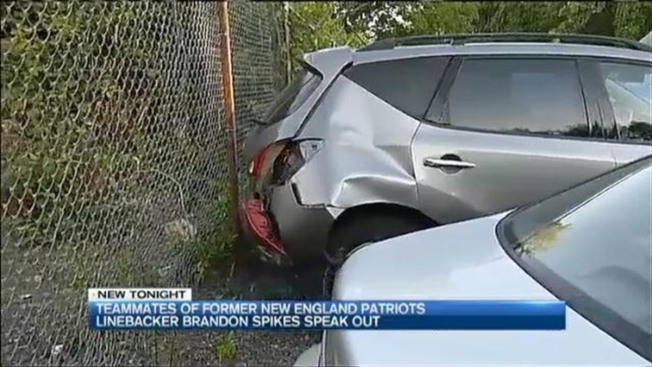 "Investigation indicates the Mercedes is registered to Brandon Spikes. No deer was located." EXCLUSIVE PHOTO: The Mercedes-Benz Maybach registered to Brandon Spikes, abandoned at the scene, is towed from the scene of a crash on I-495. Around the same time, troopers got a report that a car in the same area as the abandoned car had been rear-ended by a vehicle the occupants did not see. Three people - a 52-year-old man, a 32-year-old woman and a 12-year-old boy, all from Billerica - were taken to the hospital with minor injuries, authorities said. So far, no connection has been established and no charges have been filed. Police say they have contacted Spikes and are investigating whether the incidents are related. Phone and email messages left Monday with Spikes' agent weren't immediately returned. Police are investigating whether Brandon Spikes' Mercedes-Benz Maybach (right) and this Nissan Murano carrying three people collided. 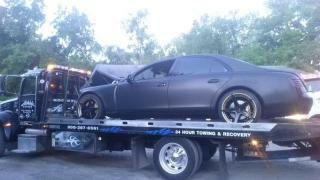 Spikes' vehicle was left at the scene and its driver reported hitting a deer, which was not found. Spikes' release is his second troubled parting from the Patriots. He was placed on injured reserve on Jan. 6, 2014 in his fourth season with the team before its first playoff game after playing with an injured knee during the season. He questioned the decision to place him on IR and the Patriots didn't re-sign him when he became a free agent. He spent last season with the Buffalo Bills after signing a one-year contract. "It's just great," Spikes said upon joining Buffalo. "(To) be somewhere I'm wanted - that was the whole thing for me." On May 18 this year, he returned to the Patriots under a one-year deal to shore up a linebacking corps hit by injuries. Dont'a Hightower may not be ready for the season following shoulder surgery after New England's win over Seattle in the Super Bowl, and Jerod Mayo played only the first six games before a right knee injury that required surgery ended his season. "It just feels great to be home and I'm happy to be there," Spikes said on May 29 during the Patriots organized team activities. "I'm here to work and make this ballclub. It's that simple." He didn't want to discuss his previous stint with the team that drafted him in the second round out of Florida in 2010. "You can clearly see that me and the Hoodie (coach Bill Belichick) kissed and made up," Spikes said. "I'm here. That's in the past and I'm moving on. " A strong defender against the run, Spikes has played 66 NFL games with 384 tackles, two sacks, two interceptions, seven forced fumbles, and one fumble recovery.